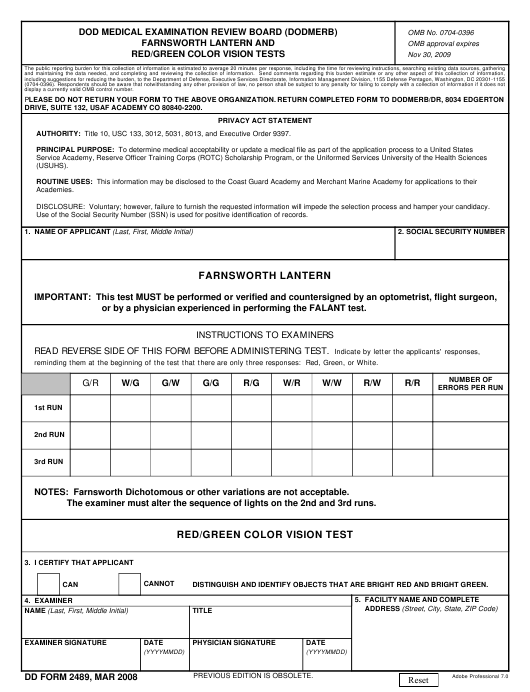 DD Form 2489 or the "Farnsworth Lantern And Red/green Color Vision Tests" is a Department of Defense-issued form used by and within the United States Army. The form - often mistakenly referred to as the DA form 2489 - was last revised on March 1, 2008. Download an up-to-date fillable PDF version of the DD 2489 down below or find it on the Department of Defense documentation website. DRIVE, SUITE 132, USAF ACADEMY CO 80840-2200. AUTHORITY: Title 10, USC 133, 3012, 5031, 8013, and Executive Order 9397. DISCLOSURE: Voluntary; however, failure to furnish the requested information will impede the selection process and hamper your candidacy. Use of the Social Security Number (SSN) is used for positive identification of records. or by a physician experienced in performing the FALANT test. READ REVERSE SIDE OF THIS FORM BEFORE ADMINISTERING TEST. reminding them at the beginning of the test that there are only three responses: Red, Green, or White. NOTES: Farnsworth Dichotomous or other variations are not acceptable. The examiner must alter the sequence of lights on the 2nd and 3rd runs. DISTINGUISH AND IDENTIFY OBJECTS THAT ARE BRIGHT RED AND BRIGHT GREEN. 3. Station examinee eight feet from lantern. face the source of room illumination. 2. Only one person should be tested at a time. one error per run is made, examinee is passed. color combination exists, top one first." depress button in center of knob to expose lights. Maintain regular timing of about two seconds per light. nine combinations has been exposed. of lights, examinee is passed. receive more than 3 total runs.